No question, that first visit to Japan was a complete and utter disaster. Firstly I had learned absolutely nothing and then less than 30% of the Koi shipped arrived alive. Another 25% of those were lost soon after, purely as a result of the time spent in the cartons. The gold-toothed crook Miya had waited patiently for his revenge on me until the night before packing when the interpreter told me he needed a ‘10% cancellation fee’ for the Koi had had NOT purchased! Then to twist the knife he added that if I refused to pay the mythical charge he would not pack the Koi for the other members of the party. I paid the charge with great reluctance and vowed I would never ever buy a Koi from him. He was under the natural impression that none of the party would ever return to Yamakoshi and he was almost correct – trouble was, I did. In the years that ensued at the times I was buying more Koi than I could have ever dreamed of, he’d always come over to me with a bow and a smile – I did the same back to him, but never gave him another penny! In autumn ’79, after a divorce and a decision to quit my job and become a professional Koi dealer, I returned alone to Yamakoshi and stayed at the Grand Hotel in Nagaoka. The city of Nagaoka is merely ‘just around the corner’ from Nigorisawacho, the entrance to Yamakoshi and yet it is surprising as to how few Nagaoka folks have ever visited the area. In ’79 Nagaoka City resembled how the latter day film producers portrayed Dodge City in the westerns. Timber buildings, timber sidewalks, timber awnings but, by the time the late 1980’s came around, it was a city of steel, concrete, bricks and open pavements. I mention this because the original decadence of Yamakoshi undertook the same changes throughout the same time span. 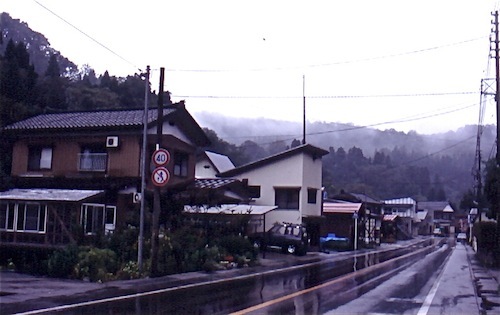 Yamakoshi, in the mid late 1990’s became to be almost approaching ‘civilisation’ but in the late 1970’s it was almost a wilderness where few other than the residents would care to venture. Whilst there were Japanese Koi dealers and Japanese Koi enthusiasts who ventured there in the late ‘70’s, please be assured – very few foreigners had ever stepped foot into the area then known as Yamakoshi. Only one single village had any smack of ‘modernity’ back then and it was the one right next to the main route 17 that linked Nagaoka to Ojiya. Many years later when the coach parties of Koi foreigners first started to trickle through, this village was always the very first stop – it had to be, no other villages could be accessed by coach as freely! The village itself was a single straight road that exited route 17 and, after that road exited the village it entered into ‘the vast unknown’ – well that was my impression anyway. Everything after that was pure ‘Mystique’ to me. In ’79 that village was my first single port of call as a complete loner. The staff at the Grand Hotel advised my taxi driver to take me there and even wrote the name down for me – but what was the importance of village names to me back then? I did ask to be dropped at the start of houses and chose to walk through the village to ensure I didn’t miss a single ‘chance Koi’ along the way. I walked for a few hundred yards until I came upon a vaguely familiar sight of the roadside pond on my right and memory told me I had probably returned to the man who had sold me my very first Koi in Niigata. It had to be the place, I looked farther on to my left and there was Miyaishi, the crook’s outlet, to confirm it all. I knocked on the house door and shouted ‘Hi’, no one answered and after a few minutes I decided to continue walking. In an attempt to compress all this, I ended up late that day in the company of a certain ‘Mr. Hiroi’ who had befriended me and even drove me back to my hotel with the promise that he would collect me the next morning and take me to many Koi outlets in Yamakoshi on the following day and he did just that! Mr Hiroi was simply a genuine villager who had seen me walking by, probably with a confused look on my face, and had offered his assistance. It later turned out that he had no interest in Nishikigoi but his friends and neighbours owned the outlets he was to show me on the next day. We could not converse at all but the first outlet he showed me was the very same roadside pond! As we climbed out of his car he said some words to me I did not understand except for one – ‘Torazo’ – he actually said ‘Torazo’! Look, there were very few things I missed about Koi in those days and accurate information was extremely hard to come by. One of the many things that had haunted me was that I had heard that there was a Koi breeder in Japan who produced magical Sankes with Sumi patterns that resembled the stripes of a tiger and that the Japanese name for tiger was ‘Torazo’. When Mr. Hiroi mentioned ‘Torazo’ my ears pricked up instantly as he led me towards the house. Surely this small house with small ponds could not be the home of the legend built up in my mind that was ‘Torazo’? Oh yes – it was! Even though it was my second visit to Yamakoshi I was still in total confusion and few things actually registered with me because I was ‘Alice’ and all that surrounded me was ‘Wonderland’. I was in the village of ‘URAGARA’. At the Koi outlet named ‘URAKAWA’. But was known to every Koi enthusiast in Japan as ‘TORAZO’! Jeez! All that would not really sink in for at least another five years hence. All of this was of not the slightest importance to me at the time; all I wished to do was buy a bucket load of magnificent Sanke bearing sumi patterns that resembled the stripes of a tiger! I wandered around the outdoor concrete tanks to observe the Koi and at last discovered an indoor house with one pond of around 3,000 gallons and another half the size.